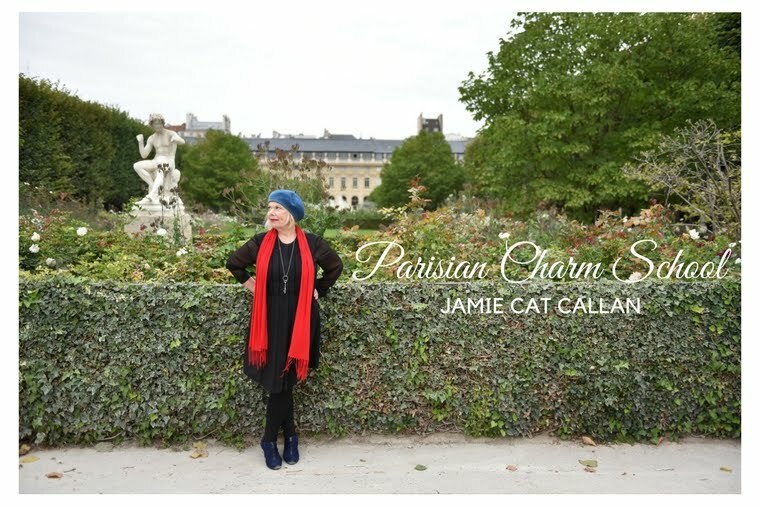 Jamie Cat Callan: Bonjour, Paris! Jamie Cat Callan on Why "French Women Don't Sleep Alone"
American author, teacher and femme extraordinaire "d'un certain age" Jamie Cat Callan came to Paris this week to promote her latest best-selling book,"French Women Don't Sleep Alone: Pleasurable Secrets to Finding Love", to a packed audience (of women andmen) at WH Smith. Jamie is American, but tells the audience "I have French blood running through my veins" thanks to her late French grandmother. Much of what she first learned about French women was learned during the summers she spent with her grandparents, observing how her grandmother dressed ("She always wore hats"), how she kept the spark going in her marriage ("she wasn't afraid to storm off and ignore him all day if they had an argument"), and how she cooked ("the way to a man's heart is still through his stomach"). The fact that most of us in the audience live in France (and some actually are French) doesn't seem to dampen our enthusiasm for finding out what else she knows. We all want to know how to have that same confidence and mystery of French women. And Jamie did, too, so to research the book she came to France and spent time interviewing French women to get the inside scoop. Some highlights? First of all, says Jamie,French women don't date. This one was actually hit home for me, since I had brought someone with me to the reading to avoid going on an actual "date" and was hoping his English wasn't good enough to figure out the irony of the event I suggested. As she points out, the pressure is just too much on dates; they're like long interviews. So what do French women do? Dinner parties! Or any other group event that allows them to mingle and get to know each other in a stress-free environment. Another tip? Learn how to untie your scarf. Those of us who've finally figured out how to tie the scarf totally missed the dramatic potential for taking it off. So innocent, yet so full of innuendo...if you're doing it right. And Jamie gave the perfect demonstration! Finally, the third secret from her book that she shared was about matching lingerie. French women always wear matching lingerie -- the pretty stuff, too -- every day. "Don't wait for special occasion to wear beautiful lingerie, to use the nice China, to enjoy the beautiful things you have." In answer to the skeptics who point out that men can't see that you're wearing matching lingerie, she says, "But you will know, and that will make you feel good and when you feel good you look good, you glow from the inside." And then she reveals her own little hidden happiness: a peek of red slip! Then Jamie asked if we had any questions...and instead of the usual polite question or two, the crowd got into a spirited debate about the French men vs American men, whether her advice will work in the US, whether her observations of the French might be a bit too...flattering? But Jamie is totally unflappable in her message. "This is a love letter to the French, " she admits, but is adamant that the basic message still applies. Quite the diplomat, she fields the different opinions and statements (more than questions) with aplomb and grace. A real Lady! You can find Jamie's book at WH Smith in Paris, Amazon.com, and your local bookstore in North America.